IFA BERLIN 2013 is the place where we meet for the first time some of the best gadgets of 2013. It represents the largest European electronics fair where we’ll get a chance to see in action the most wanted “celebrities” from the world of gadgets: smartphones, tablets, laptops. In 2013, just like last year, the battle is taking place on the battle filed of specifications, because the smartphone or the tablet was not reinvented too much in the last two years. The end of 2013 brings us some new devices and hopefully some new surprises. As expected, Samsung created a buzz with its Galaxy Note 3 and its Galaxy Gear, but Sony and ASUS exhibited interesting products as well. 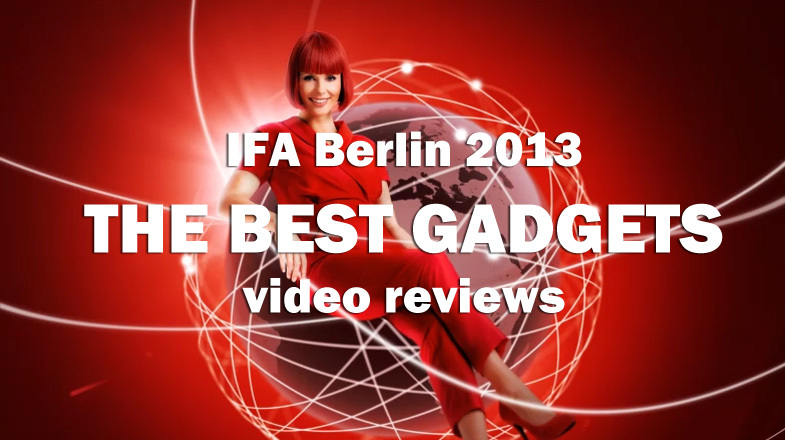 Although the following video reviews contains mostly brief descriptions of the gadgets, we still get a chance to see live some of the best gadgets presented at IFA 2013. Samsung Galaxy Note 3 is a smartphone with a Super AMOLED HD screen of 5.7 inches, a quad-core processor clocked at 2.3 GHz and 3 GB of RAM. It’s compatible with Samsung Galaxy Gear, the intelligent Smart Watch that was also launched at IFA 2013. The company claims that the new Samsung Galaxy Note 3 is optimized for the best viewing experience and multitasking. It comes with an S Pen that helps you use your phone to its true value. The tablet has a 10.1 inch screen with a resolution of 2560x1600p, an octo-core processor clocked at 1.9 GHz, 3 GB of RAM, a main camera of 8MP and a secondary camera of 2MP. There are three options for the storage capacity (16GB, 32GB or 64GB) and the S-Pen is also present. Samsung Galaxy Gear is a smart watch that can be used with Galaxy Note 3 and other smartphones and tablets from Galaxy family. The gadget is more than a normal watch, because it connects with your smartphone via Bluetooth and displays your notifications and music controls. You can also perform a call directly from the smart watch, you can take pictures or you can send messages. The smartphone is only 8.5 mm thick, it has a huge sensor (1/2.3 “) which is about 70% higher than those found on most smartphones available on the market now. The 5-inch screen has a resolution of 1080p and it uses TRILUMINOS and X-Reality technology, which is also present in Bravia TVs. The smartphone features a 800 Snapdragon chip, quad-core clocked at 2.2 GHz. The battery has 3000 mAh. The main feature: the 20.7MP main camera. This laptop is the new extension of Lenovo’s Yoga range of laptops. It has a 12.5” display that can be tilted around, so if you buy this gadget you will end up with a laptop that transforms into a tablet. ASUS has brought to IFA Berlin 2013 the Zenbook UX301 and UX302, two ultrabooks that are protected by Corning Gorilla Glass 3 with Native Damage Resistance. The two laptops were exposed for the first time at Computex 2013. Both gadgets have a 13.3 inch IPS screen with a resolutions of 1920x1080p and 2560x1440p. The screen is 10 Point Multi Touch so it is suitable for the operating system Windows 8. The tablet looks premium and it has the same dimensions as Galaxy Note 8.0. Its display measures 8.3” and supports a 1,920×1,200-pixel resolution. The tablet is powered by a 1.7GHz quad-core processor, and 2GB of RAM. Note: make sure to check this post again, I will upload it every few hours. What’s your favorite gadget presented at IFA 2013? Can your computer still be infected if you have an antivirus installed?